Maybe I read too much science fiction in my formative years, but there's something about the idea of leaving Earth - even just to orbit - that I find very exciting. Watching the space shuttle take off makes my heart start beating a little bit faster. The current shuttle mission, STS-118 on the Endeavor, is extra special because one of the mission specialists is elementary school teacher Barbara Morgan. In 1986 Morgan was the backup to Christa McAuliffe in the "Teachers in Space Program." In January 1986, the Challenger was launch with McAuliffe aboard. Of course, the Challenger and McAuliffe never made it to space. Now, almost 22 years later, Morgan has finally become the first teacher in space. Following the completion of two years of training and evaluation, she was assigned technical duties in the Astronaut Office Space Station Operations Branch. She then served in the Astronaut Office CAPCOM Branch, working in Mission Control as prime communicator with on-orbit crews. More recently, she served in the Robotics Branch of the Astronaut Office. You know that question always kind of makes me laugh! People don’t ask the physician astronauts or the engineer astronauts or the chemists: “Are you still a chemist? Are you still a physician" or “Are you still an engineer?” Yes, I’m still a teacher and look forward to eventually going back in the classroom. I do know teaching is tough and challenging. And there’s a skill to it, just like everything else. You have to keep up with that. I’m going to need to sharpen my skills again, take some classes, and go observe a lot of my colleagues and work hard to get back into it to be able to do as good a job as I can. I know this is going to sound corny, but Morgan's story makes me choke up a bit*. I don't know how she feels about it, but "finally going into space after 22 years" would be the high point of my life. Oh, well, maybe I'll be a space tourist someday . . . I had to learn how to be a scientist. But I had an interest in understanding how things worked. And when someone explained it to me, and better yet when they showed it to me and I could see things moving around, then the light bulb went on inside. And what I really liked about chemistry in particular was it answered questions like, why the sky was blue. I mean, it really answered it! It wasn’t just some fairy tale, nursery rhyme, it was the real thing. Why water boiled. I was really surprised to find out it didn’t have so much to do with temperature as I thought. Just all of these, all of these everyday things that you come in contact with, science answered. And better, chemistry made complete sense out of math! And I was not only not good at math. I was afraid of it and I told myself I wasn’t good at it because it just didn’t come natural. And I struggled with it probably more than I needed to. When I got into college and I started to get very involved in chemistry and taking classes I never knew existed when I was in high school about chemistry, I started to use math more. And when I learned things in calculus that were so strange, you know, as a concept, like well, who thought of this? And why do we use this? When I got to chemistry and started learning the physics of chemistry I actually started using that math to describe the properties of an atom. And I could picture an atom in my head and I, I knew what atoms did and I could see how the math explained what an atom did. It, it made so much more sense to me. And I really enjoyed that, just learning how things worked. And that sums up a big part of the fun of science for me: making sense of the way the world works. Sometimes I wonder if initiatives to encourage girls to study engineering and science that emphasize "helping humanity" are just missing that point. Anyway, now, four days into the Endeavor's mission, they've found the heat shield on the belly of the shuttle was damaged during launch. NASA is reporting that they don't believe repairs are necessary, but, even so, I'll be holding my breath when they land. My best wishes are being sent to Morgan, Caldwell and the rest of the Endeavor crew. Space.com video of Barbara Morgan talking about being an Educator Astronaut. * On some days, the photo montage during the opening credits of Enterprise gets to me in the same way, so maybe I'm just a bit of a sap. Photo: From the official NASA mission page. 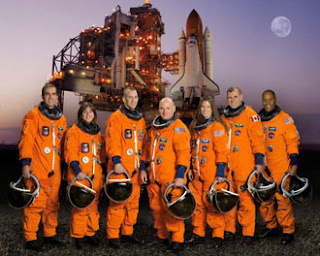 The crew members of STS-118 pose for their official portrait. Pictured from the left are mission specialists Richard A. (Rick) Mastracchio, Barbara R. Morgan, Pilot Charles O. Hobaugh, Commander Scott J. Kelly and mission specialists Tracy E. Caldwell, Canadian Space Agency's Dafydd R. (Dave) Williams, and Alvin Drew Jr.
Now that I'm in a reasonable time zone to watch the shuttle go up live, my life/work/whatever literally stops for the 30 minutes around launch time. I sit at my computer watching live Nasa TV on the internet, with my fingers crossed. If it is aborted, I'm back the next day. Each time that shuttle goes up I get shivers - it is what we are supposed to be doing. It is next, it is about understanding the universe and science exploration at it is best. I'm keeping my fingers crossed for Endeavor's safe landing too. I don't think you are a sap at all about Enterprise, somedays it catches me the same way too. I'm glad I'm not the only one that feels that way!